The genotype data for the ancients that I focused on in that blog entry is now freely available in the Mathieson et al. 2018 dataset via the Reich Lab website (see here). So let's take a closer look at one of these samples, Yamnaya_Ukraine_outlier I1917, easily the most Caucasus/Near Eastern-shifted Yamnaya individual in the ancient DNA record to date. Yes, it's a female, with a very Near Eastern mtDNA haplogroup to boot, so she cannot, in all likelihood, be the result of mixture between a Caucasus/Near Eastern father and Eastern European mother. This is where she plots in my Principal Component Analysis (PCA) of ancient West Eurasia. Unlike the rest of the Yamnaya samples, Yamnaya_Ukraine_outlier I1917 is sitting much closer to modern-day North Caucasians, such as Chechens and Lezgins, than to the vast majority of Europeans, ancient and modern-day. 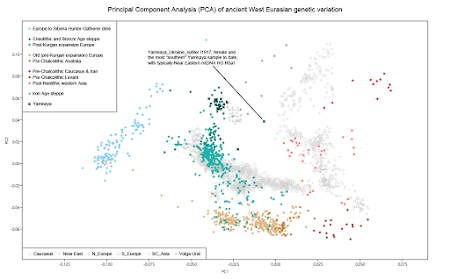 Looking at this plot, it's tempting to think that she might represent an as yet unsampled ancient population from the North Caucasus, or nearby southernmost steppes, that once bridged the genetic gap between Eastern Europe and the Caucasus, but has since disappeared from the scene. Using the Global25/nMonte method, I can try to infer which ancient populations this so called outlier is most closely related to. This might give me some clues as to the origin of at least a part of the southern ancestry in Yamnaya. I've chosen to go with Yamnaya_Samara I0429 as the Yamnaya reference, because he's both one of the oldest and least Caucasus-shifted Yamnaya individuals in my dataset (marked on an earlier version of the above plot here). And at the risk of overfitting, I'll throw in six other reference options. The relevant datasheets are available here and here. It's a fascinating result, even if somewhat overfitted. The Global 25/nMonte method is more sensitive to recent genetic drift than formal statistics-based modeling, so I'm not surprised that Caucasus Hunter-Gatherer (CHG) KK1 is not shown to be an important source of ancestry for Yamnaya_Ukraine_outlier I1917. Instead, the chronologically more proximate samples from Early Bronze Age and Chalcolithic Transcaucasia (Armenia_EBA and Armenia_ChL, respectively) top the list after Yamnaya_Samara I0429, which does make good sense. Moreover, minor gene flow from Neolithic foragers and farmers from what is now Ukraine (Ukraine_N and Trypillia, respectively) is implied, and obviously this is also very plausible. Thus, it seems likely that population movements from the Armenian Plateau did have an impact on at least a part of the Yamnaya poulation, even if mostly on its maternal side. Another question worth asking is whether, conversely, people like Yamnaya_Ukraine_outlier I1917 were, by and large, an important source of southern admixture in Yamnaya. At least according to this Global 25/nMonte model, perhaps they were. Sounds like she was high in K-7 Basal Eurasian-rich genes. If so, this group is associated with the spread of agriculture south of the Caucus mountains and maybe the spread of R above it. Quite a record for whoever they were if it checks out. Plenty of that in ancient Eastern Europeans without any Basal Eurasian ancestry. Too which Culture could that Armenian Plateau population have belonged to ? It would make more sense her mom immigrated to Ukraine from somewhere in the Caucasus instead of her being a representative of Yamnaya's southern ancestor. Btw, people, this would be one of few times you'll see legitimate immigration instead of migration in pre-historic times. Can't you figure out if her mom was from the Caucasus by looking at the ancestry makeup of her autosomal chromosomes and X-chromosome? If not her mom, definitely multiple recent Caucasian ancestors. Could that Armenian Plateau population be linked to Maykop or Pre-Maykop ? There's not enough data on the X to say anything for certain. It would also be interesting to see if any of the recent Beaker genomes had a parent or grandparent from different tribes (Beaker vs local western European). Are there any news about Maykop DNA? Is it still attached to South Asian aDNA paper? What about autosomal? Like, my grandma's Scandinavian ancestry is represented by two giant chunks because it comes from her grandma, while mine is represented by many tiny chunks because it comes from multiple great great grandparents . An Iberian Beaker with recent Steppe ancestry then would have big Steppe chunks instead of tiny ones like modern Iberians. Does that line of thinking work for ancient DNA? "distance%=4.1635" --> Probably could use another Steppe group. "distance%=3.9222" --> Probably could use another Steppe group. "distance%=4.2307" --> NE groups could probably use an E Asian stand-in to reduce distance; perhaps another Steppe group as well. "distance%=4.163" --> NE groups could probably use an E Asian stand-in to reduce distance. "distance%=19.2864" --> Good. Fit should be bad for Onge; ie. super drifted from "ASI_Ghost". "distance%=4.2555" --> Probably needs whatever Iranian Bandari needs. "distance%=5.4307" --> if I add Iran ChL or Hotu this model will probably fit fine. I'd need diploid ancient genomes for that. This one is pseudo-haploid. So are the Beakers. No, I didn't mess the spreadsheets (quadruple checked). Maybe this Yamnaya outlier is about as Yamnaya as that Slav from Bohemia was a Czech Beaker. In other words, not at all. It seems that one should be able to employ vector subtraction just as easily as vector addition, but I'm not sure how all the ancient components are expected to behave. "Plenty of that in ancient Eastern Europeans without any Basal Eurasian ancestry." True, and now modern R's have more, though not as much as in Southern Europeans. So did modern R's get it all from Southern Europeans, or was Basal K-7 also spreading on the Y-hap R side north of the Caucuses too? With this sample, it seems like the latter. The area around Armenia seemed to have these folks who are associated with the rise of Agriculture and the Y-hap G and later J expansions and civilization building. Did the same group, through exogamy, also help kick-start Yamnaya or near kind to expand greatly on the northern side? "I'd need diploid ancient genomes for that. This one is pseudo-haploid. So are the Beakers." Someone should start a short-list of the ancient genomes that would give the greatest impact from having higher coverage. Maybe these would get put to the top of the list for new technological testing. There are thousands of average samples, where low coverage is fine. But there are some of these very interesting cases where much higher coverage would give great insight by being able to impute and phase a fully diploid genome. Groups suspected to be close family members would also be high on a list of prime samples for high coverage studies. Yamnaya_Ukraine_outlier I1917 belongs to mtDNA haplogroup R, not to Y-haplogroup R. This sample doesn't have a Y-chromosome, because it's a female. On the other hand, one of the earliest and least Basal Yamnaya individuals, Yamnaya_Samara I0429, is a male and belongs to Y-haplogroup R1b. Also, from the Khvalynsk guys who precede Yamnaya and who might be ancestral to Yamnaya, one belongs to R1a and the other to R1b. The have even less Basal than Yamnaya_Samara I0429. And Eastern European foragers, with no Basal at all, are rich in Y-haplogroup R. So no, it doesn't look like a population like Yamnaya_Ukraine_outlier I1917 brought Y-haplogroup R to Eastern Europe. Omitted Armenia_EBA and Chl, but blasted all kinds of other samples, expecting a crazy overfit with which I'd hoped to hone in on things properly. Instead, this is what I got. Not as crisp of a fit, granted, but rather interesting considering that Dereivka/Sredny Stog are thought by some to have contributed in Yamna's genesis, no? Therein may lie the source of Yamnaya's EEF, but I wouldn't rule out additional Maykop influence. Btw, she doesn't really like Han, Nganassan or Ulchi admix in this model. So she's unlikely to be a Sarmatian Amazon. Included Armenia_EBA and Chl this time, but it still preferred the three above. So, high chances of contact between the Yamnaya and Armenia, and this might very well be the exact moment when the Armenian IE language arrived there. Now, the Basal present in the Baltics and Corded Ware in general was also from the Armenian region? The Beaker paper closed the door for Corded Ware peoples contacting the Beakers. Or mtDNA doesn't support this? Or does it indeed? Also, regarding the Sicilian, were those Anatolia_ChL genesis and expansions a byproduct of this epoch? If the Yamnaya contact with Caucasians wasn't peaceful, it might have pushed people from there to flee to Anatolia. Looks like possible Shuvaleri influence via Caucasus. BTW Dave your lack of South Caucasus contact theory is also looking rather poor. Same story here with the first two. Did not take Armenia_EBA or Chl. So, I wouldn't be so quick at this point in thinking of South Caucasus as being formative in Yamnaya's genesis:this girl could very well be a late import from there(Maykop horizon possibly, with added ANF-like ancestry previosuly absent in the Caucasus) after things were mostly 'said n done'. This one gave me an overfit, so I trimmed things down but still got a decent fit. Not sure what's going on here and it's somewhat overfitted wrt Ukraine, though(prolly wanting some extra Hg ancestry). This caused an expansion of this Armenian group, which, by virtues of Elite rule and relative low admixture, mostly retained their non R1b yDNA. The ones who stayed would speak what became known as Armenian - those who migrated to Anatolia mixed there creating the Anatolia_ChL guy and settling what would become the Anatolian IE languages. This would imply that Minoan was a very early IE language related to Anatolian first and Armenian second, and that those Anatolian_ChL expansions by sea carried highly ancient-like/diverged IE languages. The Mycenaean/Minoan paper did use Armenians to model them, that's a clue, and this Yamnaya girl adds to the mystery. Having CHG + Balkans hide the Armenian. This sample is not related to proto-Armenians. Proto-Armenians are later, probably after 2500 BC when Yamna culture didn't exist anymore. While linking her with proto - Hittite is also problematic because it is too late. It is probably some kind dead end population. Btw can someone model Armenia Chl with all this new samples. If crossing Balkanes is problematic then maybe Hittites crossed Caucasus that is why we have that steppe in Armenia Chl. Please use for references for Armenia Neo this pops, Iran Neo and Tepecik. Barcin is not related to Shulaveri culture that preceded Armenia Chl. You can use also antihistoric Armenia_EBA. It is quite possible that Shulaveri culture was similar to Kura-araxes. Are you referring to the Yamna_Bulgaria model? The reason I included Balkan_Chl samples is because the I2a Yamnayan from Bulgaria looks to be a mix of "original" Yamna and locals at first glance. Regular Yamnayans(Samara, Ukraine, Kalmykia) took neither Armenia nor Balkans. Yamna having primarily CHG could be realistic, imo, if ANF-like ancestry crossed the Caucasus AFTER the region's earlier CHG-like north-bound migrants already played their formative part in Yamnaya. "It looks like red hair frequencies more than quadrupled in frequency after the Beaker folk arrived in the British Isles. This makes it a uniquely British development, however, it could have happened simultaneously all over northern Europe including the northeast." this is certainly plausible and if true doesn't lead anywhere much except figuring out what would cause red hair to be selected in certain spots but not others. however Udmurts http://www.bbc.co.uk/news/magazine-29950844 and for me more importantly Chinese records of northern barbarians having red hair and green eyes make me wonder if there are other more interesting possibilities. 1) there may be other genes that cause/caused red hair which haven't been identified and which have been replaced or maybe switched off in some way since then. 2) a newer version of skin lightening allele that included an improved ability to tan being selected for after the ice age among people who already had the red hair version. not suggesting this happened - just a logical exercise to see where it leads. "In light of all these findings, what do you guys think about the Arctic home of Aryans theory?" it's a fun idea and if you defined "Arctic" to mean "somewhere very cold north of the Himalayas" then unless i've missed something isn't it pretty close to recent findings? This sample could be interesting if it was 1000 older. If correctly dated by C14, it says nothing about Steppe ethnogenesis. I understand you are reckoning a mistake regarding datation, but even so, you are postulating the existance of a population similar to Armenian_BA hundred of years before it is attested. Not impossible, but not the more likely. The Yamnayan I2 subclade is also present in the Steppe. It is not the result of some local admixture. By the way, given what we know about Yamna and other Steppe population, and their Y haplogoups homogeneity, it is more likely to consider that R1a, R1b and I2 were part of the original Steppe ethnogenesis. Minoan is non-IE language. It is perfectly clear. Moreover, regarding the IE Anatolian branch, Yamna were present in Bulgaria and the Bosphorus (even at Istanbul) already 3000 BC. They seem to be localy admixed (minor Balkan contribution), as usual probably though female lines, but notheless they have a huge Steppe component. So, the logical consequence would be that Steppe ethnogenesis is older of at least some centuries, so achieved around 3500 BC. And they are far better candidates for the ancestors of Palians (Pala is just on the other side of the Bosphorus), Luwians and Hittites than any other Steppe admixed population. "The Yamnayan I2 subclade is also present in the Steppe. It is not the result of some local admixture. By the way, given what we know about Yamna and other Steppe population, "
The earliest I2a2a1 is found in Lepenski Vir and Zvejnieki, then Hungarian Neolithics (ALPc) as the very I2a2a1b sublcade. It appears in Ukraine during the Mariupol & early sredni Stog, incl with full ANF G-W profile. A further problem with your scenario is that no kurgans have been found in Anatolia (to date). The I2 subclade in Yamnaya_Bulgaria is not I2a2a1b, it's I2a2a1b1b. The earliest I2a2a1b1b is found in a steppe forager: Ukraine_Neolithic I1738, dated to 5473-5326 calBCE. It is not found in the Balkans before the Bronze Age! So it can't be a marker of Balkan farmers or pastoralists moving into the steppe. Rather, it's a native steppe marker moving out of the steppe during the Bronze Age. We've discussed this before on a couple of occasions, and nothing has changed since then. If I2 is originally from the Balkans (and I didn't disagree on the point), its early presence in the Steppe is only showing what I said: it was part of Steppe ethnogenesis. It is therefore not surprising to find it in Yamna in Bulgaria. And not a clue about local admixing in maternal line. 2400BC is perfectly coherent for a migration of the ancestors of Hittites and the like in Anatolia. The Anatolian branch is attested only around 2000 BC, and it is postulated several centuries "in situ" to explain the Hattian substrate in Hittite, and similar one (but different) in Luwian. That's why many European scholars are postulating an arrival of IE in Anatolia in the late IIId millennium BC. Did you read the article of Isabelle Klock-Fontanille about the Hattian and Hittites scribes? The intrusive caracter of IE is relatively clear. The fact there were also migrations from Anatolia in the late IIId millenium is only backing the possibility that Yamna could have been pushed out of Bulgaria and Bosphorus. At last, mind that the Pala has been undersearched till today. No search, no find. Thanks. It's "only" the third or fourth time you've posted this answer. "this is certainly plausible and if true doesn't lead anywhere much except figuring out what would cause red hair to be selected in certain spots but not others." It's pretty for sure. Beaker folk have a very direct relation to modern British & Irish. Basically, roughly 35-40% of Irish carry one of those varients. You can't combine frequencies to find the percent of carriers because redheads carry two mutations and therefore raise frequencies. Frequencies are slightly lower but similar for British. So, we're seeing a huge rise in frequencies not just in Ireland but possibly all over northern Europe after 2000 BC. Latvia Bronze age appears to have had a high frequency like modern Balts & Finns do. Several, Yamnaya, Afanasievo, and Steppe Eneolithic individuals appear to carry R151C and R160W but need higher coverage to confirm. Based on Udmurts, Tocherian, and other stuff I do suspect it has mostly a Steppe source. A red haired possibly Yamnaya-decended person with Z2013 in Beaker Hungary is good evidence for that. With 200+ EEF samples, one R151C in Neolithic Greece and one R160W in Chalcolithic Bulgaria popped up confirming it might be more complicated. Could someone please try to model Chal/BA/Iron Age samples from the Balkans/Bulgaria and then compare them to how modern Bulgarians are modeled(thanks Alberto for the PCA, btw)? I guess I'm the only one who thinks BA/Chal southern Balkans were Basque/Iberian like, which means to get modern southern Balkan people you would also need extra MENA/Caucasus, or more of something almost identical to Yamnaya(which likely didn't exist by the middle BA other than near the Volga, and then adding on any significant northern Slav admixture wouldn't add up), not just Slavic from the north. "who only thinks BA/Chal southern Balkans were Basque/Iberian like is a big deal*"
Myceneans and Minoans were like Basque? Not even close, and what about Vucedol? @Eric / Ariel, I think one thing that makes this hard to talk about, and why no one has really tried much modeling here, is that the "Balkans BA" is sort of a bunch of samples from different countries, in different time periods and different contexts. Results: A few of the Croatian Vucedol and EMBA / LBA samples sit with North Italians (Bergamo) while most Balkans_BA from Bulgaria sit either with early Neolithic or in a "no man's land" between Sardinians and North Italians. (Certainly no where near enough WHG rich Middle Neolithic ancestry to sit too near to the Basques.) One Bulgarian sample (I2165) is probably by chance sitting fairly near recent Bulgarians, Serbs, Romanians. We'd probably reasonably expect the Croatians of this time to tend to be North Italian like (it's not too far from Bergamo to Croatia and closer than to Bulgaria? ), until they get more admixture from whatever expanding genetic wave links Baltic BA / Balts / Slavs / Hungarians. Judging from the position of the Bulgaria_IA, the Bronze Age Bulgarians would need more Mycenaean/Anatolia_BA-like ancestry to get to there, and then more of the Balt-Slav / Baltic BA type ancestry to get to present day position. It mostly looks like you can cover the present day populations in Bulgaria and Croatia by Bulgaria_IA / Croatia_LBA + some more "genetically northern" Slavic ancestry. But the sampling is extremely sparse and scattered (e.g. random Steppe_MLBA like sample in Bulgaria in MLBA), so it's hard to say too much with confidence. How is this coherent with Proto-Amatolians moving in ? “However this situation changes in the second quarter of the 3rd millennium when Yamnaya- type kurgans and burials sharply diminish in numbers, and Ezero Tell sites expand regionally and locally. So you see you and Dave have things upside down; which is why Dave’s models are crap- a monkey at a typewriter. There's 2 that plot directly with Basques, 3 in that no mans land(but inbetween Iberians and Sardinians/farmers, not N. Italians), and then the rest are between N. Italians and Sardinians/farmers. So yeah, that's what I was referring to. Not sure if I misrepresented the ones plotting near Iberia. Anyway, still seems to get to modern Bulgarians from BA Bulgarians, if they were at N. Italian or inbetween N. Italian and Sardinian, you still need either some stuff from BA Greece/Anatolia or just Yamnaya without any N. Slavic to get to modern Bulgarians, and the former seems more likely. For many around here everything that clusters "south" of Basque was a byproduct of the Roman empire or something even more recent. All those moments will be lost in time, like tears in rain. We're assuming geographic contiguity. The reality is that populations, societies and cultures didn't completely 'fill' a space on a map. The actual situation would have looked more like 'swiss cheese' with large gaps between primary settled areas in which other cultures and societies resided. This outlier may be a reflection of another non-Yamnaya population resident on the steppe. There is some intermarriage, but also another population in the same space. In other words, these guys are not Bronze Age! They're actually some of the unusual, very early samples with very high levels of HG admixture from SE Europe and the overlap the Basques because the combination of a significant amount of Euro HG with very slight EHG admixture and early Neolithic ancestry turns out to be a decent first approximation to Basques. (However, if we looked at the higher dimensions that specifically capture the Iberian vs SE European HG drift and others, we'd find they were fairly obviously not Basques). So these are I0700 and I1108. In Davidski's Data I0700 is Balkans_MP_N (MP = Malak Preslavets) and I1108 is Malak_Preslavets. (I'm not sure why they have different pop labels when they're from the same site?). Haha. OK, I looked at that label and couldn't work out what the MP stood for. I'll change the label in the datasheets later today. Could someone analyze new data from polish neolithic genome project? Genoms are here https://www.ebi.ac.uk/ena/data/view/PRJNA318237. There are samples from Kujawy (neolithic and bronze age). @Davidski, hah, glad that was useful. @Ariel, in fairness though, that did kind of make sense with the assumptions of the time: 1)All European MNChl cultures had the enriched HG of the German and Spanish samples, and 2) all Steppe into Europe was mediated through the typical LNBA Northern European populations. Data was kind of limited and the qpAdm method for estimating Steppe v Anatolian v WHG in Haak's paper was kind of crude, so we couldn't really understand how this led to present day European diversity. The Croatian Vucedol sample that fits with Italians (rather than the one that doesn't) looks to get there by have a fair whack of pretty steppe direct admixture and almost no extra HG, which violates both the assumptions. (Not in fairness, yeah, Otzi already kind of fuxxed with one of those assumptions by having lower HG, so we should've known HG bounceback could be limited in the south and southeast, and there were already a stream of BA Hungarian samples in that plot that kind of overlapped North Italy. But I think can only say that with hindsight, since I'm sure I said something at the time that's a bit cringe now.). "Half a decade" is a bit of a harsh comparison though, we only had Haak's paper preprint in 2015 and then Mathieson's preprint about two years later. I'm not sure how they could've gone any quicker! (And remember, pre-Haak it also seemed like the "logical" thing was to have some kind of pure WHG-ANE population moving into Europe, which also seems absurd in retrospect, requiring torturous explains of what we now know to be the "CHG component"). Ukraine Mariupol ( I3719) I2a2a1b1: 100% EEF ; O % Meso Ukraine !! They migrated from the west . It’s found in Chalcolithic Tell site at Smyadovo (3300-3000 BC) which dates before Yamnaya. Well, 3300-3000 BC isn't older than Yamnaya, since there are plenty of Yamnaya remains dated to exactly this period. And which of the Smyadovo samples do you mean, because none of the ones I can find are individuals from the Chalcolithic with I2a2a1b1b, or even I2a2a1b1b. Ukraine Mariupol (I3719) I2a2a1b1: 100% EEF; O % Meso Ukraine!! But that's I2a2a1b1 not I2a2a1b1b. The oldest instance of I2a2a1b1b is in a steppe forager with no Balkan admixture. What you need to do is to find a sample with I2a2a1b1b that is older than the Bronze Age and is obviously not from the steppe, or at least intrusive to the steppe. I'll totally agree that I2a2a1b1b is not from the North Pontic steppe if you can do this. The genetic cline in the West Eurasian PCA that runs from North Italy to Cyprus, and then onto Lebanon, does not date to the Beaker and Minoan periods in Southeastern Europe. It is much more recent than that. You seem to be confused by the fact that the Sicilian Beaker, Mycenaeans and Minoans cluster close to modern-day Sicilians and South Italians. But close isn't close enough in this case, because this is an artifact of looking at such complex things with only two dimensions of genetic variation. Using many more dimensions than just two clearly shows that modern-day Sicilians and South Italians have North African and Levant ancestry that is missing in the Bronze Age Southern Europeans. I don't care to haggle over the exact percentages of this admixture for now. I don't have a strong opinion about that. All I know is that the amounts are significant, as in certainly above noise level, and the aforementioned cline could indeed date back to the Roman period. Let's wait and see. Rob, grabs any genetic support for his ideas based on archaeology. No there's no good evidence the two I2a2a1b1b in Yamnaya derive from Balkan farmers instead of Ukraine hunter gatherers. In the same sense, he'll have a hard time grappling with the fact the genetic formation of Bell Beaker and Corded Ware had nothing to do with the Balkan or Caucasus. Genetically speaking Bell Beaker, ones with R1b P312, is just a fusion between a Steppe group similar to Yamnaya Samara and farmers they meet somewhere in Central Europe like Globular Amphora. Corded Ware represented an unadmixed group probably from Ukraine. Later, they mixed with local farmers & hunter gatherers. In both cases no *genetic* influence from the Balkans or Caucasus. Other than small amounts of EEF already in Yamnaya & proto-Corded Ware, no indications of Balkan genetic influence. Of course the CHG, Caucasus, influence though is huge. To get someone who clusters with mainland Italians in a West Eurasian PCA, you need significant Anatolian/CHG and Steppe influence on top of an EF base. Mycenean is the closest thing but still doesn't match up. At the earliest, I'd say there were people of that combo during the Bronze age. Off topic. But I think it is important to mention ancient DNA throws away the idea modern day people outside of America have strong genetic continuation going back 1,000s and 1,000s of years. Genetic shifts, usually caused by related peoples near by, happened in Europe once every several thousand years. It doesn't make the current people living there un-native but it reveals the population history is more complex. Would if the Steppe invasion happened 1,000 years ago. Would Brits, Scandinavians, Poles, etc. count as native? The answer is definitly yes. In our minds 4,500 years is long ago enough for that not to be a question. But it is entirelly possible in some parts of the world their version of the "Steppe invasion" happened more recently which will change their perceptions even more for what it means to be "Chinese" or "Indian" or whatever. You have not provided any evidence whatsoever that the I2a2a1b1b in Yamnaya Bulgaria and Kalmykia is from Balkan farmers rather than steppe foragers. There's a lot of issues with sample labels here. I am going through the paper and dataset one by one. Many of the Chalcolithic Bulgarians are listed as Bronze Age, and visa versa, I believe. It is a bit of a mess. Iain might have to be contacted to clarify this. The Balkans_BA and Balkans_ChL cluster just fine based on their labels. All of the Balkans_BA, except one, show clear steppe admixture, and that singleton outlier is clearly dated to the BA. None of the Balkans_ChL samples in the dataset now show clear steppe ancestry. OK then, show me a single forager from Britain belonging to L21. But wait, there's a steppe forager belonging to I2a2a1b1b. That's the problem though. Some of your BA samples might be CA w/ steppe-like ancestry and farmer like BA samples. I've asked David about it. Well I don't think they labeled them based on genetic ancestry, but rather on dating and archaeological context. Well, some of the labels look wrong. These are different in the paper and the data, from what I see. The label on the right is the paper. The labels on the left are correct. The labels on the right don't match the ADMIXTURE bar graph in the paper, the supp spreadsheet, or the dating. Look at the beginning of the paper that discusses the samples. I'm going off of that. Where in the beginning of the paper? The labels in the dataset match the sample info in the spreadsheet that came with the paper. And everything fits nicely, as far as I can tell. Well, for that sample, the spreadsheet says that the "culture" is Bulgaria_BA, but the analysis label says Balkans_Chalcolithic, and the dating fits the analysis label. So the contradiction is probably warranted based on different concepts of what BA and ChL mean in the context of Bulgaria vs the Balkans. I don't know. 75 and 76 might be okay. I am asking David. Yeah, I2510 clusters strongly with Balkans_ChL. But it looks like it's C14 dated to the Bronze Age. There might be some problems with the supp info PDF. Hey Davidski, where can I find that same PCA in your original post but showing the different modern populations? I don't have one like that. But if you plug the datasheet into PAST, you can highlight the pops you're interested in. PAST is freely available here. @Dave What is the distance range to be aiming for in Global 25/nMonte3 for a plausible model yet not overfit. I remember with the G10 and previous nMonte it was below 0.5% and above 0.2%. "Off topic. But I think it is important to mention ancient DNA throws away the idea modern day people outside of America have strong genetic continuation going back 1,000s and 1,000s of years. Genetic shifts, usually caused by related peoples near by, happened in Europe once every several thousand years. It doesn't make the current people living there un-native but it reveals the population history is more complex. " Dave might blast me for replying to your off-topic post again, but this time I am pleased that you are thinking more clearly. As a Turk, I can't *not* imagine any point of history in which people were immobile, and that groups who met each other had zero chance of mating. The base level of homogeneity assumed throughout all discussions is pretty astonishing to me. Like, is it really all that incredible to imagine a person as a mixture of some diverse X, Y, and Z? My Puerto Rican best friend has got admixture from every corner of the globe. Why would we assume a zero probability to something like that? However, the issue is the extent to which such people made a contribution to their adopted population. If the vast majority of mixing is happening between proximate groups, even tightly bounded regions, well-delineated by language and culture, then that effects the overall dynamics. Even in such a scenario, however, one must allow non-zero probability of mixing between neighboring populations. The "true" model, IMO, for some "snapshot" in time (pick your favorite era) involves a grid-like Markov chain embedded on the map of the world, with some long-range (non-grid) connections corresponding appropriately to more mobile groups. One could assign "flow" (which is like the Markov transition probabilities, but must be viewed as a flow of genetic influence instead) according to the expected homogeneity/heterogeneity of a particular location, due either to geographic isolation/barriers, or some cultural/linguistic aspects. Modelling western Europeans with 60%+ R1b P312 as Beaker Netherlands, plus Neolithic farmers who lived in their region, plus Anatolia BA & Levant BA, plus Moroccan. The most iffy score is ANatolia BA because we don't have a good representative for the recent east meditreaen ancestry in western Europe yet. These scores are similar to what I got in 2015 using the genomes availble and using Cypriot as a proxy for recent east med ancestry. Interestingly, French and French_South favor France_MLN over Iberian farmers. Ceasar said Gaul contained two people groups; Celts & Aquitania. Mainstream French descend from the Celts, Southwest French descend from the Aquitania as do the Basque. Why do Spanish & French score Anatolia BA but Basque and south French don't? COuld the East Med influence pre-date Roman conquest? J2 & E1b-V13 make a presence in Spain and France. Clearly, people from either southeast Europe or Anatolia settled there. I've been pushing for recent "East Med" (diverse region) in western Europe back when people stubbornly stuck to the EF+Steppe model. 3 groups, plus one small village still holding out against the invaders. I post mine and my mother's, with and without French Farmers, without, my Anatolian_BA increases and for my mother it's the opposite. I think the combined Anatolia_BA+Moroccan signal in Iberia is an aggregate and results from a few events---I wouldn't treat them at face value. Phoenician, Greek, Roman and early medieval influences from North Africa(and east Med) are obvious, but most people overlook the assimilation of (formely Jewish) Conversos. We can rule out the Circum-Aegean dynamics of 2200BC described by Heyd, tho, because that only seems to have made landfall in Italy and the Balkans. E-v13 Needn't be from the East Med, but merely a Cardial Ware marker. We already have such a Neolithic sample from Catalonia. "The Yamnayan I2 subclade is also present in the Steppe. It is not the result of some local admixture." Local input is indicated in this case by ADMIXTURE and PCA results. I didn't imply he had local admixture because of I2a2a1b1b. Yeah, that I2a2a1b1b Vovnigi sample dates back to 5400BC. What is its estimated date of formation? A good while before this or no? Maybe its presence in Ukraine is related to an influx of Balkan/Carpathian foragers bearing this Hg? Was the Ukrainian Mariupol I2a2a1b1 also xI2a2a1b1b? Or they simply didn't determine? Thanks. I was expecting something from Ukraine but it is still EHG that is preferred for Armenia Chl. Well this is not related to proto Hittites. This is probably the result of some kind old contacts of South Caucasus with Volga region. Not surprisingly we have H2a1 both in Volga and in SC. I don't know what that Ukrainian Mariupol farmer had exactly, but as things stand it wasn't I2a2a1b1b. I2a2a1b1b is found in a steppe forager with no farmer ancestry, as well as Bulgarian and Kalmykian Yamnaya. So there's nothing at present to suggest that it moved into the steppe during the Neolithic or Chalcolithic, rather than moving out of it with Yamnaya etc. I2a2a1b1b seems a specific Steppe related subclade, only found in an Ukrainian forager and 2 Yamna. The main thing is the fact it was probably part of the Steppe population ethnogenesis, along with R1b L23 and R1a. Its parent subclade could have been ultimately a WHG marker. But this is not the point. I don't see why, based on current data, we should consider I2a2a1b1b as a proof of a Balkans Farmers admixture in the Steppe. Note that I am convinced that there is some Farmers admixture in the Steppe population, but probably mediated through female lines. Mind that it doesn't mean an admixture exclusively from females, but only that social structure probably preserved the original males lines. Hence return to patriarchal, patrilocal and patrilineal of proto-IE societies. You misanderstood me: I'm perfectly aware of the BA migration from Anatolia (in fact, from more Eastward). That's not the point. But why do you think that Bulgarian Yamna vanished in thin air? Don't you think, as we can see in other places and times, that at least some of them try to find another place to live when they were pushed out of Balkans? Like, Northern Anatolia, bordering the Black Sea? About Yamna, Bulgarian ones are dated from 3100 BC to 2500 BC. At least one of them has probably be found at Sliviri (Istanbul) dated from around 3000 BC (we still wait for the archeological report). Many Kurgans from Turkey have been destroyed without been searched (hundred of them). So, except if you are going to contest those archeological reports, Yamna culture is dated from around 3100 BC, at least in Bulgaria. Meaning it's going back at least 1 century or 2 in the Pontic Steppe (as nobody will defend a local origin for Bulgarian Yamna, and a migration takes time). So, Yamna could be dated from around 3300/3200 BC. You can call them pre-Yamna, but it's the same population. "OK then, show me a single forager from Britain belonging to L21. But wait, there's a steppe forager belonging to I2a2a1b1b." Funny, shame the joke back fired. Because MEsolithic Ukraine has so far turned up R1bs, R1a, and I2a1. I2a2 appears during the Mariupol Neolithic. Seems your still not very good with these basic distinctions. So where is I2a2 found during the Mesolithic - Iron Gates, Latvia and South Germany ! West of Ukraine. Of course things might change with more samples, but I2a2/ I2a2a1 is definitely of western provenance. So what do these new, incoming elites look like from Dereivka etc. ? Hate to be the fly in the ointment yet again, but I'm pretty sure that the ancestors of the Ukraine_N guy with the I2a2a1b1b did not spread agro-pastoralism to the steppe. Hey, maybe they spread some sort of foraging and fishing techniques from the Balkans, but definitely not agro-pastoralism. I do contest what you say. Yamnaya is an amalgamation, even if "proto-Yamnaya' begins to emerge in the VOlga area c. 3300 BC (albei arbitrarily defned, and not 'classic). The I2a2a1b in Bulgaria are from a long line of "Meso-Meds", to use old school anthro terms (see above data). 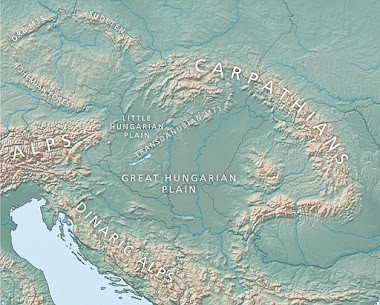 That is, I2a2a1 were Danube-Carpathian foragers who first encountered ANFs, and helped expand agropastoralism to the steppe, as one arm, in addition to the second arm from CHG (Sam's loving "2 way"), and some trickled back down into Bulgaria. These moved from tells onto the steppe, encoutnered the R1b 'east Yamnayans' and bred with their women. And the main alamgamation phase dates to 2900-2600 BC, as described in numerous papers. Could these people have moved onto Anatolia ? Of course, but what happened to them ? You suggest that they performed an exodus to northern Anatolia - which sites did you have in mind ? There's Ikiztepe - but it shows no links to Yamnaya, but rather to the older Karanovo VI and Cernvoda phases (45-3500 NBC). The rest of northern Anatolia is forested mountains backing agains the Black Sea. Moreover, there's no I2a2 in modern Turkey nor even in Balkans. But perhaps more Anatolia data will reveal this. The paultry 3 samples from South Anatolia (Luwian or Palaaic territory) are so far negative for steppe admixture, and in fact what the aDNA and archaeological evidence shows is a migration from the east through Anatolia and onto Greece, Thrace and Italy. "Hate to be the fly in the ointment yet again, but I'm pretty sure that the ancestors of the Ukraine_N guy with the I2a2a1b1b did not spread agro-pastoralism to the steppe. Hey, maybe they spread some sort of foraging and fishing techniques from the Balkans, but definitely not agro-pastoralism." But I agree, the development of pastoralism took time- as long as 3000 BC, and some would argue nomadic pastoralism began in Manych variant of Catacomb culture. But after 5000 BC is exactly when you first see domesticates appearing in small numbers, and early Copper. Some exchange network operating. Sicilians and at least some southern Italians have some amount (~20%?) of post Myceneans est-med/north african admixture, Davidski showed that on the sicilian beaker post a couple of days ago, and we all agree with that, right? We don't know if they got that before or after the roman era. But do Greeks have it? Do Albanians have it? Do central Italians and northern Italians have it? Maybe some, but think about how much "north" northern Italians are on a PCA compare to Mycenaeans. This dicussion is profoundly unnecessary, and it was started way back in the day by some germans and british historians attributing the fall of the roman empire to the mixing of nordic elite with lesser slaves. Go on anthrogenica and you find that Tomenable guy posting a photo of an etruscan tomb, and he labed a blonde dude as a roman and a dark skinned dude as an etruscan, where there are no evidece of any kind of that being the case. The fact is that there were people along the cline between Basque and Cyprus since the bronze age, and there were already people not even from Italy that clustered on that cline. Look at where Vucedol is on the Neighbour Joining Tree posted by Matt (amoung Tuscans), or in this run. 1. CLOSEST SINGLE ITEM DISTANCE%"
I mean, some of these people on a superficial scrutiny will pass for a modern. Completly destroying the idea that the entirety of southern Europe was totaly different in the pre roman era, a place of beauty and joy inhabited by tall and fair nordic people. I'm against that idea, I was against before genetic evidence came out, because if was an "ad hoc" racist idea, based on political reason rather than any factual evidence of any kind. Romans and Greeks were describing themself as being swarthy, have you ever glanced at the painting in Pompeii? Do those people look nordic? Were they depicting slaves in their rich noble houses? 1-the scale of the admixture is huge, almost half of the Steppe's Early BA autosomal is from this southern source, I don't think this is the pattern you would expect if it was female-mediated (the Steppe folk must have liked them a lot), plus it was an admixture that moved to the Steppe, not the pattern for female-mediated admixture which is usually static. 2-the timing for such an increase was post-neolithic, why? why didn't it start in earlier times during the mesolithic maybe? and it's also simultaneous with other major movements from the Caucasus/Iran area, like in Anatolia_Chalcholithic or Levant_BA, no one yet claimed they were female-mediated even though movements to all three (Anatolia, Levant, and Steppe) were similar in scale, 33%, 44%, and 43% respectively, I think these movements are connected somehow. The strongest argument in favor of the female theory is Y-DNA, it doesn't seem there was any replacement of the aboriginal R1b or R1a unless it was from another R1a or R1b clade south of the Caucasus, but I find that unlikely. Maykop women might have been preferred as they would have been more numerous in an otherwise stagnant mesolithic Russian society. Agriculture and animal domestication would have been advantages to groups who simply had hunting and pottery and did not have the breeding power of sedentary Maykop. Keep in mind Yamnaya is about 45% CHG-like, and women contribute 50% of their DNA to their offspring, so the numbers aren't that strange in the above scenario, especially over several centuries. are correctly labelled Sephardi Jews. Would be great if this could be fixed. This error seems to have already been present in the Global 10. Another point about labels, the Turkish samples are all labelled like this: Turkish:RegionSampleID. This has the effect that they all get averaged into a single average, instead of regional averages. Could the labeling be changed to something like Turkish_Region:SampleID, akin to other populations with regional samples? And finally, could the non-Turkish (Kurdish, Arab, Balkan) samples be removed or differently labelled if I give you there IDs? "Completly destroying the idea that the entirety of southern Europe was totaly different in the pre roman era, a place of beauty and joy inhabited by tall and fair nordic people." It would be absurd to argue any ancient southern Europeans were Nordic. Instead, most of "Nordic"(s) ancestors 5,000 years ago had olive skin and jet black hair. Nordic pigmentation is "recent", it is a result of some kind of natural selection that we first see in Globular Amphora & Andronovo. It was in full swing in Baltic BA and those Bronze age German warriors in 1000 BC. Nobody, here is into the idea southern Europeans are Nordics corrupted by Arab slavs and other stuff. All, we're saying is the data shows Italy received gene flow from the Near East after the Neolithic and maybe more recently. I would place my bet on something between 2000 and 1000 BC when most of the excess CHG stuff came in. And then southern Italy has signifcant Levantiee stuff which could have come around the same time. An important thing to understand is all ancient's without the exact EEF, WHG, EHG, CHG, etc. percentages as a modern population aren't therefore foreign to those moderns. It should be expected that modern people are a mixture of several fairly distinct people who settled in their land over time and that nobody had the same mixture of ancestry as they do till recently. It should also be expected a modern population is more similar to their neighbors than to any ancient population. But anything, not exactly the same as a very specific modern cluster is not foreign to that cluster. Out of context, LBK seems very foreign to modern Germans. When you put LBK in context with other ancient DNA, you see they are one part of the puzzle that makes up modern Germans and Europeans. A slightly older age for the northern European cluster than the Italian or southeastern European cluster doesn't mean as some would suggest northern Europe has some great natural law preventing foreign migration or is more indeginous and ancient. It just means, for unknown independant reasons circumstances caused several post-Neolithic migrations from outside of Italy to come into Italy. The question is: how did they get the women in the first place? Did the Khvalynsk semi-hunter gatherer guys trade fish for cattle and women? Did they raid a few settlements with their sticks and stones, took over men armed with bronze swords and stole their women? I think the role of the Caucasus Mountains is not understood here. I think the warrior traditions of the IE came from the Caucasus side rather than the Steppe side. The harsh mountains have always bred elite warriors, the Circassian Mamlukes, Georgian bodyguards.. etc. One can look at how North Caucasians dominate the Russian combat sports, completely taking over wrestling, Sambo and MMA despite their low population. There is a joke among the US wrestling community that if the Caucasian republics were separate countries no one would actually medal. Indeed for for every good Russian athlete there are 5 Khabibs, Gatsalovs and Saitievs fighting for the number one spot and 5 more competing for other countries. Dorks like Shah/Kanishka can see their warrior fantasies in the streets and alleys of Makhachkala all day. Besides, I don't see the problem with R1b showing up in Maykop along with J2. The oldest Yamnaya sample with R1b-M269 is also the least Caucasus shifted, but his mtDNA does look to be from the Caucasus (HG T2c1a2). The earlier R1b Khvalynsk guy has even less Caucasus ancestry, but his mtDNA also looks to be from the Caucasus (HG H2a1). What does this suggest to you, that guys rich in R1b came to the steppe from the Caucasus and married local hunter-gatherer women? Really? You need to be able to look at data like this and make some sense of it, instead of babbling about who's doing well at the Olympics. Nonsense, the northern european cluster is not older than the southern european cluster. What about Sardinians? And the rest of Europe came to be in the bronze age, both in the north and in south in similar time frames. I mean, you will find individuals very close to to SEE Europeans in the bronze age balkans, so in loci. And BB from germany is not like modern French or Germans or Brits, it is close to them, but not identical... like Myceneans are not identical to Greeks, but a part of their ancestry. Yes, people from the north at some point raveged southern Europe, that shifted people east and north, but those high-yamnaya samples that we got are already in the "frame" of Greeks, Albanians, Central/northern Italians. They are similar by type of ancestry, if you model them, and they are similar in where in they cluster. Not less similar than Germans are to Gearmany BB, I mean! A guy from Eneolithic Croatia (or he is from Serbia? ), is like a spit away from modern central Italians, deny that, try to spin that, I beg you. It is a fact, look at the data, is the data that matters here, just the data. I am going to try one more time to be understood here. What I am saying is I think kind of along the lines of Vara. No, I do not think women from Basal Eurasian stock helped INTRODUCE populations whose males were Y-Hap R into Europe from the Steppe. I think they helped form the stock that made Y-Hap R's DOMINANT in Europe. Y-Hap Rs with low to no Basal are in Eastern Europe earlier, but they are not dominating the Y-Hap I populations. Now they DO dominate in Y-haplogroup all over Europe and they DO have more Basal Eurasian than those Y-hap R's which were living alongside but not dominating other Y-hap populations. I am suggesting that some subset of their population took wives high in Basal Eurasian, and somehow this produced some advantages which allowed them to greatly expand, as was also done south of the Caucuses by populations with Basal Eurasian (likely from the male and female side in that case). Populations now have more Basal than the earliest R Y-haplogroup samples in Europe. Where did they get it? By mixing with southerners who came through Anatolia? That would be one explanation- but the discovery of your outlier, if she is indeed K-7 rich, would provide another route. So basically, the future will us that you are right. Except that present datas are not going in your way. You are obviously making a confusion between Ia2 and its specific subclade found in Yamna. It's like saying R1b or R1b V88 instead of R1b L23. We are talking of specific subclades of Y haplogroups R1a R1b and I2a, not about the haplogroups themselves. So you are totally missing the point. Moreover, since we have at least Yamna (or pre-Yamna), Bulgarian Yamna and Corded Ware who share the same specific signature since around 3000 BC, among several cultural traits, what does it means? That a they came from a single population which existed before. So an ethnogenesis achieved at least 2 or 3 centuries before, so at least around 3300/3200 BC. And since homogeneization takes time, going back at least several centuries before. So between 3800 and 3300 BC. Northern Anatolia near the Black Sea with forested mountains, West of the river Kizilirmak? You mean the land of Pala? Where people spoke Palian, an IE language of the Anatolian branch? Yes we have South Anatolian and West Anatolian samples, from non IE cultures (pretty clear if you look at burials, with connections to Mesopotamia or South Caucasus). And only Indo-Europeanized after their conquest by Hittites. But nothing from the Konyan Steppe or North Western Anatolia. By the way, I2a is present in Anatolia, especially in the North West and in the Konyan Steppe (but it could be from the Phrygians). "So, we're seeing a huge rise in frequencies not just in Ireland but possibly all over northern Europe after 2000 BC." i guess i always come back to the idea that if depigmentation is related to vitamin D synthesis then neanderthals/denisovans in northern interior regions "ought" to have had their own versions but you wouldn't necessarily be able to tell if everyone who still had them also had the SLC genes. iirc one of the identified neanderthal genes is somehow connected to freckling - if there were neanderthal depigmentation genes that sounds like a possible candidate but like i say, hard to know how you could tell. "Nonsense, the northern european cluster is not older than the southern european cluster. What about Sardinians?" Beaker Germany & Britain have basically the same ratio of EHG, WHG, CHG, and EEF as modern northern Europeans. If you go back to the early 3rd millenium BC, northern European's ancestry goes back basically just to two groups; the farmers already in northern Europe and Yamnaya-like people who moved in. For Italy & southeastern Europe there's an important third ancestor; unknown CHG people(s) who lived probably in Aaatolia. Sardinians aren't apart of the main southeastern European cluster that mainland Italians and Greeks are apart of. They're an outlier. "A guy from Eneolithic Croatia (or he is from Serbia? ), is like a spit away from modern central Italians, deny that, try to spin that"
I don't deny that. But I doubt many people in Italy at that time carried similar ancestry. Up until 2000 BC, I bet most of Italy was overwhelmingly EEF. So, the point Samuel was trying to make is that some European populations are made of less populations than others? Therefore "older"? "And the rest of Europe came to be in the bronze age, both in the north and in south in similar time frames. " This is what I was talking about earlier. The European genetic signature didn't suddenly come to be. Nor should we measure the ancientness of clusters. Everyone today is a combo of whoever settled in their land overtime. Therefore, the farther back you go the less mixed people are and therefore the less similar they are to modern inhabitants. Anyone from the past who didn't carry the precise combo of EEF, WHG, EHG, CHG isn't foreign. Both EEF & Steppe should be considered very similar to all modern Europeans. I would imagine there's no way to determine skin tone in extinct species like Neanderthals since we can't see the phenotype expression of their genes. There might be something to the Viteman D idea. SHG, Baltic HGs, and Globular Amphora were more fair than their relatives in other parts of Europe. Maybe, that part of Europe has continuously favoured light skin & blonde hair. "the scale of the admixture is huge, almost half of the Steppe's Early BA autosomal is from this southern source"
maybe it was originally limited to a small population who were adjacent to the farmers and then that mixed population expanded dramatically over the rest of the steppe? "the timing for such an increase was post-neolithic, why?" surplus females in the newly expanding farmer population? "The question is: how did they get the women in the first place? Did the Khvalynsk semi-hunter gatherer guys trade fish for cattle and women?" "I would imagine there's no way to determine skin tone in extinct species like Neanderthals"
the (apparently) neanderthal gene connected to freckling is still around in people today but you could only tell if it was connected to depigmentation if you could find someone who had it but didn't have the SLC genes (or had malfunctioning ones) - which i imagine is extremely rare. i.e. freckling as a kind of prototype depigmentation. "2. Archaeological data show that agriculture was not practiced in this region till a very later period (6). This raises some questions about the subsistence economy of the Bronze Age mining communities that settled the area." if you look at the map in the pdf the Kargaly field is directly connected to the Caspian but also on the other side of the water shed that leads to Samara bend and the Volga connecting to the west and also south to the Black Sea. Check out the updated datasheets, and let me know if you're still seeing any issues with the Sephardi Jews and Turks. Thanks buddy, that was quick. I'll check them out. Maybe your update took already care of it, but I noticed something else yesterday. At a friends request I uploaded all of the Turkish samples to Gedmatch. I ran some samples with calculators and noticed that the results don't agree with the Global25 results for those same samples. Meaning that the label mixup is not just limited to the Kayseri and SephardiTurkey samples, but involves other Turkish samples, too. It's just not as easy to spot. I had already noticed that 4 Trabzon samples scored east-eurasian + north-euro with the Global25, more than me even. I shrugged that off, thinking that they might be from western Trabzon. Looking at those samples gedmatch shows that they are regular Trabzon Turks, no Turkic ancestry at all. Sorry for being the bearer of bad news. If any of those samples are still acting strange, then I'll have to remove them, and hopefully get Turkish samples from other sources in the future. "Go on anthrogenica and you find that Tomenable guy posting a photo of an etruscan tomb, and he labed a blonde dude as a roman and a dark skinned dude as an etruscan, where there are no evidece of any kind of that being the case. " Considering the fact that in modern Italy the area of ancient Etruria is blonder than the area of Latium vetus, it's even likely that the Etruscans were blonder than the Romans... Would make sense if there was an Umbrian substratum in Etruria that got assimilated, as some ancient sources had claimed. "Sicilians and at least some southern Italians have some amount (~20%?) of post Myceneans est-med/north african admixture, Davidski showed that on the sicilian beaker post a couple of days ago, and we all agree with that, right? We don't know if they got that before or after the roman era. But do Greeks have it? Do Albanians have it? Do central Italians and northern Italians have it? Maybe some, but think about how much "north" northern Italians are on a PCA compare to Mycenaeans." Not maybe; some definitely have it! 7 out of my 8 Italian ggg-grandparents can be traced back to Cesena, Montiano and Meldola, they were born there between 1844 and 1866. They make up 25.7% of my DNA. And I do have a very clear Levantine admixture signal and a somewhat weaker, but still present North African signal on my maternal side in most tests, including the Global 25. It's hard to believe that this comes from the only unknown Italian ggg-grandparent or that the latter was somehow a migrant from Sicily - there was no such migration back then. Obviously this admixture isn't typical for Northern Italy in general. It seems to be a local specialty at most. And nowadays it's for sure more diluted because of the increased mobility and mixture also in northern Italy. @Matt, true enough but I do think some people (at least on other fora; you know what some of the people this area sometimes tends to attract can be like - we all have our biases, naturally, but some people are particularly egregious), were showing something more along the lines of obvious bias and less good faith agnosticism. But the archaeology for example was decently clear on e.g. the point of continuing contacts with Anatolia in the Bronze Age and there were hints about the potential extra Caucasus and lower WHG in at least Southeast Europe and Italy in some previous samples, as you mention. Even going by modern populations, one could see that the rather 'conservative' Gheg Albanians [a very tribal population until very recently which formed part of an already 'marginalized' population, the (proto-)Albanians, that massively expanded only in the late middle ages from an area much less coastal and more northern than the present Albanian geographical average - in fact close to/overlapping where Gheg Albanians are today] could only be explained by a decent amount of Caucasus on top of a heavy Anatolia_N base and not much steppe ancestry compared to e.g. even neighboring Balkan Slavic populations. Unless you came up with some somewhat wild scenaria, there were certain hints. So I was quite sure we'd be finding something like that at least in the Aegean and others (I remember Rob, he can correct me if otherwise, quite likely others I don't recall right now too) had expressed a similar view at the time. When the Hungarian Bronze Age samples came out, it was kinda clear what direction things seemed to be heading towards. That being said, as mentioned and going by current samples, you do need post Bronze-Iron Age near eastern ancestry in pretty much all of Southern Europe (except maybe the Basques who seem to have trivial amounts if any? ), alongside extra northern ancestry to get to the modern, more 'eastern' position (and positions on the first two dimensions can be misleading sometimes as David said, especially with samples very separated in time who might be getting in similar positions via very different mixes). This one apparently including some Levant too, not just Caucasus, which points to it being more recent. As I see it (and I remember David and others having tested something similar too in the past by using Armenia_BA vs Jordan_BA for different populations), the ratios also seem to differ and make me think that, in borad strokes, the Balkans got most of their post-BA/IA? extra from more northern near eastern sources (e.g. Anatolia-Armenia) while Italy (at least South Italy, Sicily and Sardinia - which does seem to have a small amount of it, its 'near eastern' ancestry doesn't seem to be wholly Anatolia_N) and Iberia from more southern ones (e.g. Levant, North Africa). This would also comport well with history but we'll see. You can get good models in nMonte with Global25 for Italy using ancient Balkans + Levant/Armenia (I used this combo in general instead of Anatolia_BA since it gives you a relative idea without overfitting) + northwest, for the Balkans Balkans + Armenia/Levant + northeast (the Balkans likes Baltic_BA as you've pointed out too, I believe - probably a proxy for at least part of the early Slavic ancestry; it's unfortunate that only the one sample was high enough quality for David to include, since the other two seemed more 'Baltic'-oriented compared to this semi-'western' one and an average of the three would probably have been more informative and given better fits) + maybe some northwest and for Iberia, Iberia BA + Levant/Armenia + northwest. I posted one for Sicilians in the previous thread and I can post some Balkan ones if you're curious about what they come out like, in case you haven't tried it out yourself. And of course, similar changes seem to have happened in (at least parts) of Northern Europe too with some populations much heavier in WHG than any today surviving even down to the Late Bronze Age which seems to imply similar further admixture from further south and/or east. What is clear is that few, if any, regions were absolutely static even after the Bronze Age (what a surprise), 'general mix' already coming together aside, which is not particularly surprising and that we also need many more samples since even the changes within the steppe haven't been fully clarified yet. "But the archaeology for example was decently clear"
On this point, perhaps more controversially, physical anthropology too. For example Lawrence Angel's study of cranial morphology in Greece ("Social Biology of Greek Culture Growth") is very interesting, especially in light of recent findings, for both the ancient and the modern Balkans. Angel basically saw two periods of 'significant change' in his series, in contrast to the other periods of relative stability - one in the Bronze to Early Iron Age (pre Archaic period) and another in the Early Middle Ages and he attributed both to further admixture with populations coming from both the East and the North. And indeed, for the time being, that seems to provide a good model for both the Neolithic to Iron age transition (local Neolithic + 'Near East' + 'steppe') and the early medieval to modern one (local Iron Age + 'steppe' + 'Near East') in the Balkans in general. So is there really EHG in Yamnaya?